Ambitious climbers, seeking adventures and opportunities to test their strength and skill, occasionally attempt to penetrate the wilderness on the west side of the Sound, and push on to the summit of Mount Olympus. But the grandest excursion of all to be make hereabouts is to Mount Rainier, to climb to the top of its icy crown. The mountain is very high, fourteen thousand four hundred feet, and laden with glaciers that are terribly roughened and interrupted by crevasses and ice cliffs. Peering into a crevasse on the Cowlitz glacier. Only good climbers should attempt to gain the summit, led by a guide of proved nerve and endurance. A good trail has been cut through the woods to the base of the mountain on the north; but the summit of the mountain never has been reached from this side, though many brave attempts have been made upon it. who many years before guided General Stevens in his memorable ascent, and later Mr. Bailey, of Oakland. With a cumbersome abundance of campstools and blankets we set out from Seattle, traveling by rail as far as Yelm Prairie, on the Tacoma and Oregon road. Here we made our first camp and arranged with Mr. Longmire, a farmer in the neighborhood, for pack and saddle animals. The noble King Mountain was in full view from here, glorifying the bright, sunny day with his presence, rising in godlike majesty over the woods, with the magnificent prairie as a foreground. The distance to the mountain from Yelm in a straight line is perhaps fifty miles; but by the mule and yellowjacket trail we had to follow it is a hundred miles. For, notwithstanding a portion of this trail runs in the air, where the wasps work hardest, it is far from being an air line as commonly understood. A view of Mount Rainier from Paradise Lodge on the south side of the mountain at an elevation of 5400 feet. The Summit of Rainier stands at 14,411 feet. By night of the third day we reached the Soda Springs on the right bank of the Nisqually, which goes roaring by, gray with mud, gravel, and boulders from the caves of the glaciers of Rainier, now close at hand. The distance from the Soda Springs to the Camp of the Clouds is about ten miles. The first part of the way lies up the Nisqually Canyon, the bottom of which is flat in some places and the walls very high and precipitous, like those of the Yosemite Valley. The upper part of the canyon is still occupied by one of the Nisqually glaciers, from which this branch of the river draws its source, issuing from a cave in the gray, rock-strewn snout. About a mile below the glacier we had to ford the river, which caused some anxiety, for the current is very rapid and carried forward large boulders as well as lighter material, while its savage roar is bewildering. At this point we left the canyon, climbing out of it by a steep zigzag up the old lateral moraine of the glacier, which was deposited when the present glacier flowed past at this height, and is about eight hundred feet high. It is now covered with a superb growth of Picea amabilis; so also is the corresponding portion of the right lateral. From the top of the moraine, still ascending, we passed for a mile or two through a forest of mixed growth, mainly silver fir, Patton spruce, and mountain pine, and then came to the charming park region, at an elevation of about five thousand feet above sea level. Here the vast continuous woods at length begin to give way under the dominion of climate, though still at this height retaining their beauty and giving no sign of stress of storm, sweeping upward in belts of varying width, composed mainly of one species of fir, sharp and spiry in form, leaving smooth, spacious parks, with here and there separate groups of trees standing out in the midst of the openings like islands in a lake. Every one of these parks, great and small, is a garden filled knee-deep with fresh, lovely flowers of every hue, the most luxuriant and the most extravagantly beautiful of all the alpine gardens I ever beheld in all my mountain-top wanderings. We arrived at the Cloud Camp at noon, but no clouds were in sight, save a few gauzy ornamental wreaths adrift in the sunshine.Out of the forest at last there stood the mountain, wholly unveiled, awful in bulk and majesty, filling all the view like a separate, new-born world, yet withal so fine and so beautiful it might well fire the dullest observer to desperate enthusiasm. Long we gazed in silent admiration, buried in tall daisies and anemones by the side of a snowbank. Higher we could not go with the animals and find food for them and wood for our own campfires, for just beyond this lies the region of ice, with only here and there an open spot on the ridges in the midst of the ice, with dwarf alpine plants, such as saxifrages and drabas, which reach far up between the glaciers, and low mats of the beautiful bryanthus, while back of us were the gardens and abundance of everything that heart could wish. Here we lay all the afternoon, considering the lilies and the lines of the mountains with reference to a way to the summit. At noon next day we left camp and began our long climb. We were in light marching order, save one who pluckily determined to carry his camera to the summit. 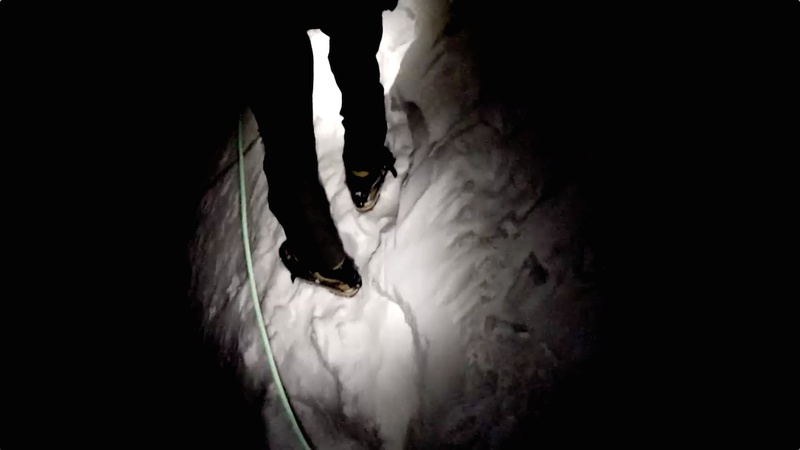 At night, after a long easy climb over wide and smooth fields of ice, we reached a narrow ridge, at an elevation of about ten thousand feet above the sea, on the divide between the glaciers of the Nisqually and the Cowlitz. Here we lay as best we could, waiting for another day, without fire of course, as we were now many miles beyond the timberline and without much to cover us. After eating a little hardtack, each of us leveled a spot to lie on among lava-blocks and cinders. The night was cold, and the wind coming down upon us in stormy surges drove gritty ashes and fragments of pumice about our ears while chilling to the bone.Very short and shallow was our sleep that night; but day dawned at last, early rising was easy, and there was nothing about breakfast to cause any delay. About four o'clock we were off, and climbing began in earnest. We followed up the ridge on which we had spent the night, now along its crest, now on either side, or on the ice leaning against it, until we came to where it becomes massive and precipitous. Then we were compelled to crawl along a seam or narrow shelf, on its face, which we traced to its termination in the base of the great ice cap. From this point all the climbing was over ice, which was here desperately steep but fortunately was at the same time carved into innumerable spikes and pillars which afforded good footholds, and we crawled cautiously on, warm with ambition and exercise. Setting up on Ingraham flats. At length, after gaining the upper extreme of our guiding ridge, we found a good place to rest and prepare ourselves to scale the dangerous upper curves of the dome. The surface almost everywhere was bare, hard, snowless ice, extremely slippery; and, though smooth in general, it was interrupted by a network of yawning crevasses, outspread like lines of defense against any attempt to win the summit. Here every one of the party took off his shoes and drove stout steel caulks about half an inch long into them, having brought tools along for the purpose, and not having made use of them until now so that the points might not get dulled on the rocks ere the smooth, dangerous ice was reached. Besides being well shod each carried an alpenstock, and for special difficulties we had a hundred feet of rope and an axe. We remained on the summit nearly two hours, looking about us at the vast maplike views, comprehending hundreds of miles of the Cascade Range, with their black interminable forests and white volcanic cones in glorious array reaching far into Oregon; the Sound region also, and the great plains of eastern Washington, hazy and vague in the distance. Climbing in high winds to high camp. Clouds began to gather. Soon of all the land only the summits of the mountains, St. Helen's, Adams, and Hood, were left in sight, forming islands in the sky. We found two well-formed and well-preserved craters on the summit, lying close together like two plates on a table with their rims touching. The highest point of the mountain is located between the craters, where their edges come in contact. Sulphurous fumes and steam issue from several vents, giving out a sickening smell that can be detected at a considerable distance. 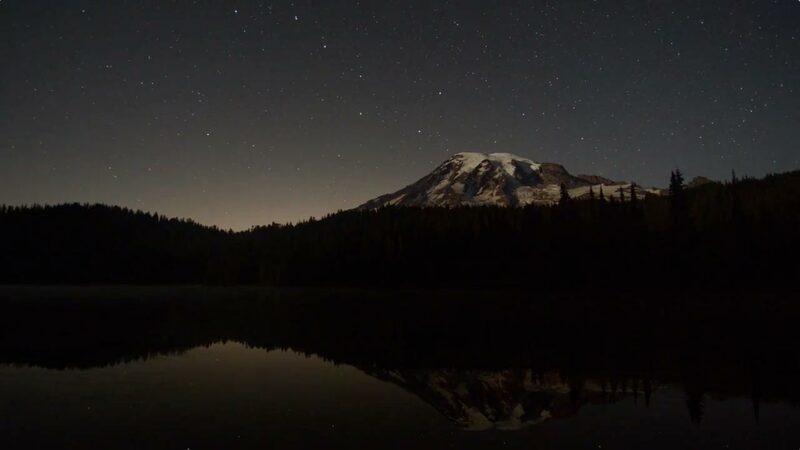 The unwasted condition of these craters, and, indeed, to a great extent, of the entire mountain, would tend to show that Rainier is still a comparatively young mountain. With the exception of the projecting lips of the craters and the top of a subordinate summit a short distance to the northward, the mountains is solidly capped with ice all around; and it is this ice cap which forms the grand central fountain whence all the twenty glaciers of Rainier flow, radiating in every direction. The descent was accomplished without disaster, though several of the party had narrow escapes.One slipped and fell, and as he shot past me seemed to be going to certain death.So steep was the ice slope no one could move to help him, but fortunately, keeping his presence of mind, he threw himself on his face and digging his alpenstock into the ice, gradually retarded his motion until he came to rest. Another broke through a slim bridge over a crevasse, but his momentum at the time carried him against the lower edge and only his alpenstock was lost in the abyss. Thus crippled by the loss of his staff, we had to lower him the rest of the way down the dome by means of the rope we carried. Looking south from the summit, with Mt. Adams in the distance. Falling rocks from the upper precipitous part of the ridge were also a source of danger, as they came whizzing past in successive volleys; but none told on us, and when we at length gained the gentle slopes of the lower ice fields, we ran and slid at our ease, making fast, glad time, all care and danger past, and arrived at our beloved Cloud Camp before sundown. We were rather weak from want of nourishment, and some suffered from sunburn, notwithstanding the partial protection of glasses and veils; otherwise, all were unscathed and well. The view we enjoyed from the summit could hardly be surpassed in sublimity and grandeur. But one feels far from home so high in the sky, so much so that one is inclined to guess that, apart from the acquisition of knowledge and the exhilaration of climbing, more pleasure is to be found at the foot of the mountains than on their tops. Doubly happy, however, is the man to whom lofty mountain tops are within reach, for the lights that shine there illumine all that lies below.